This was the last of the watercolour backgrounds on glossy cardstock that I made a couple of weeks ago. I'll be honest - I enjoy the process of the watercolour background (especially on glossy paper) but then I tend to get stuck and not know what to do with them! So I pick them up and turn them around in my hands until I see a shape to work with - in this case a crashing wave splash. 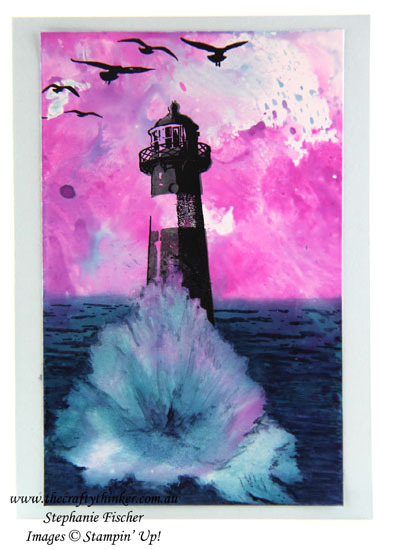 So then I looked at my sea/beach type stamp sets and when my eye fell on the lighthouse I was immediately reminded of that wonderful photograph of the lighthouse seemingly being engulfed by a huge crashing wave. Do you know the one? 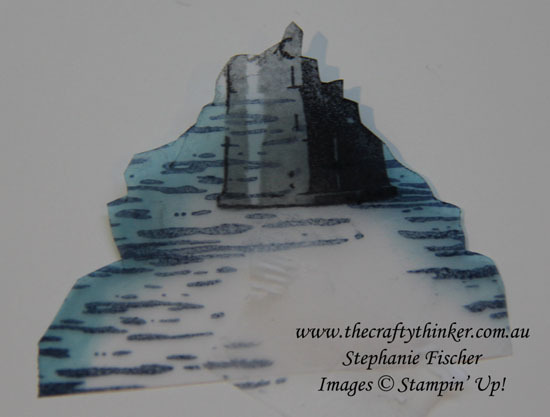 So I made myself a mask by tracing the wave onto some vellum and cutting it out and then I stamped the two-step lighthouse with Basic Black and Basic Gray inks and sponged the sea with Island Indigo and Dapper Denim inks before stamping the waves with Night of Navy ink. Once I'd removed the mask I used Night of Navy ink, a finger dauber and paintbrush to soften the edges a bit and to add a little definition to the area. The birds are stamped with Basic Black ink.